My almost year-old Mac Mini hard drive failed last week. It least it had the courtesy to fail before the manufacturer’s one year warranty expired. Granted it failed two days before the expiration date, but it still fell within the warranty period. After a three-day diagnostic, I learned that none of the files on the hard drive were retrievable. I was still confident that my trusty external back up hard drive had saved my files. As it turned out, the external hard drive had been scrambled, and no files were retrievable. The mac, new hard drive in place, came home. I hired a technician to set up a backup system and make sure the wi-fi and printer were working. Oddly enough, I was not concerned about the fact that the files lost included the last four manuscripts I had completed, as well as several early drafts of each one, all of my pictures from the last four years, various letters and forms, and thirty-two plus bookmarks I had established. For two years I have tried unsuccessfully to either categorize or erase many of the bookmarks. I have hard copies of the four manuscripts and drafts, the forms and the really important letters. I think it’s very easy to think that because we have invested our time and energy in collecting data and establishing files on a computer, that the loss of that information would be devastating to our daily lives. It isn’t. I have hard copies of the manuscripts. Even the pictures I “lost” from my hard drive are in photo albums. Not all of them, but enough for my purposes. The only “information” we can lose that truly affects our lives in any profound way is not found on a computer hard drive, but in our hearts. It is the memory of those we love. 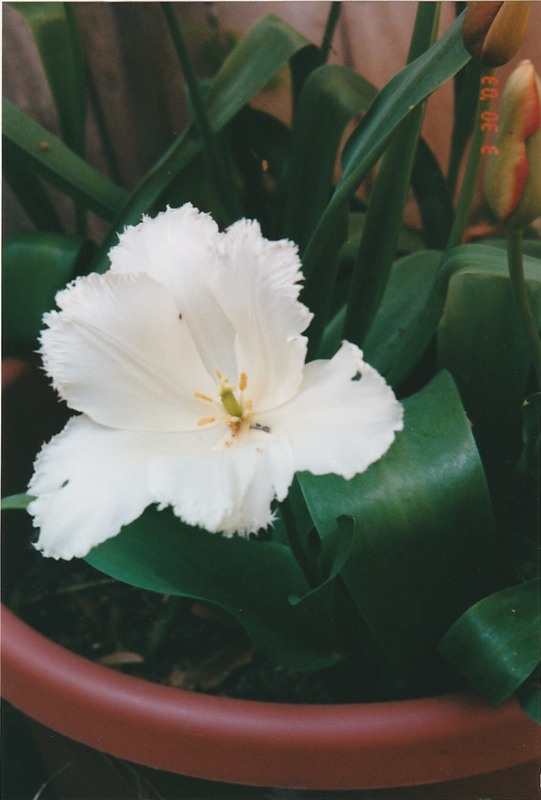 Tulip from my garden, March 3, 2003 – an oldie but goodie.